Dali sketching Harpo as he plays a harp with barbed wire for strings and spoons, knives, and forks glued to its frame– a gift from Dali. Salvador Dali loved the Marx Brothers. He loved their madcap, anarchic comedy. In particular Dali loved Harpo Marx—the blonde corkscrew-haired comic mime whose visual comedy—unlike the quick witty repartee of his brother Groucho—was universal and needed no translation. Dali described Harpo as one of America’s three great Surrealists—the other two being Walt Disney and Cecil B. DeMille. The pair first met at a party in Paris in 1936. Harpo told Dali how much he liked his paintings. 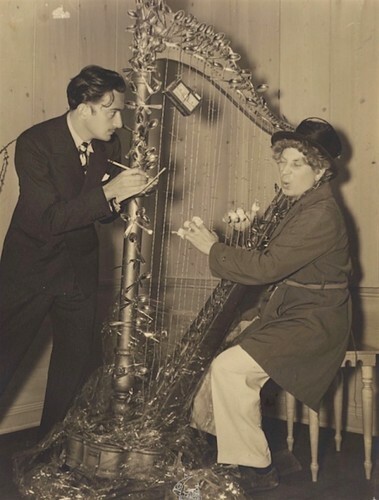 Dali told Harpo how much he loved his films—in particular Animal Crackers, which he described as “the summit of the evolution of comic cinema.” Dali gushed over Harpo’s performance where he pulled fish and cutlery from his pocket and shot the hats of beautiful women—this was true Surrealism! 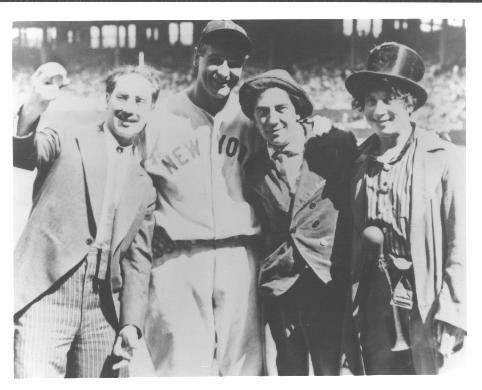 As we recall that the Marx Brothers had a remarkable range of friends, we might send classy birthday greetings to one of them, Lou Gehrig; he was born Heinrich Ludwig Gehrig on this date in 1903. A first baseman for the New Your Yankees for 16 years, he was know (for his stamina) as “The Iron Horse.” A member of six World Series champion teams, he was an All-Star seven consecutive times, a Triple Crown winner once, an American League (AL) Most Valuable Player twice. He had a career .340 batting average, .632 slugging average, and a .447 on base average; he hit 493 home runs and had 1,995 runs batted in (RBI). Elected to the Baseball Hall of Fame in 1939– the year of his retirement– he was the first Major League player to have his uniform number (4) retired by a team.